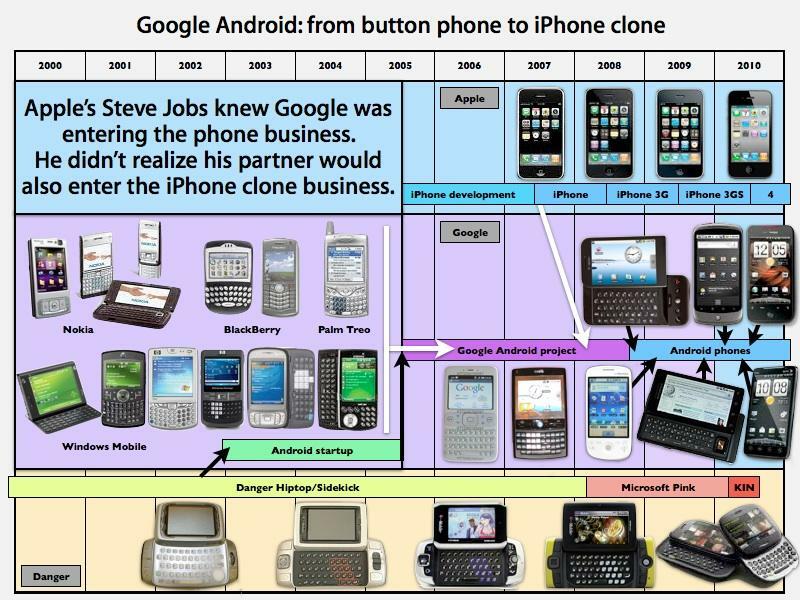 A recent reply brief in Apple's patent infringement case against HTC with the International Trade Commission implies that Google executive Andy Rubin got the inspiration for the Android framework during his time as a low-level engineer at Apple. Rubin spent time at Apple from 1989 to 1992 before moving on to General Magic and then Danger, which made the Sidekick. After founding Danger, he went on to start Android Inc. Google acquired Android in 2005, bringing Rubin on to head development of the open-source operating system. As noted by Florian Mueller of FOSS Patents, Apple is accusing Taiwanese handset maker HTC of distorting history to discount Rubin's time at the Cupertino, Calif., company. According to Apple, HTC has "omitted a highly relevant fact that Rubin worked with the inventors of a patent that the ITC has initially ruled HTC infringed on. "Android and Mr. Rubin's relevant background does not start, as HTC would like the Commission to believe, with his work at General Magic or Danger in the mid-1990s," Apple wrote in the court filing. "In reality, as the evidence revealed at the hearing, Mr. Rubin began his career at Apple in the early 1990s and worked as a low-level engineer specifically reporting to the inventors of the '263 [realtime API] patent at the exact time their invention was being conceived and developed." Apple went on to suggest that Rubin may have used ideas from the patent in his work on the foundation of Android. The company's court filing did note that the issue is not "directly relevant" to the case, while alleging that it does show that HTC has taken liberties in its efforts to overturn the ITC's ruling. "It is thus no wonder that the infringing Android platform used the claimed subsystem approach of the '263 patent that allows for flexibility of design and enables the platform to be "highly customizable and expandable" as HTC touts," Apple continued in its brief. 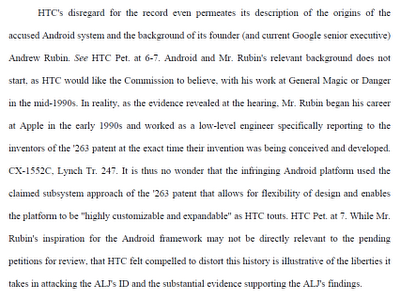 "While Mr. Rubin's inspiration for the Android framework may not be directly relevant to the pending petitions for review, that HTC felt compelled to distort this history is illustrative of the liberties it takes in attacking the ALJ's [initial determination] and the substantial evidence supporting the ALJ's findings." The patent in question is U.S. Patent No. 6,343,263, entitled "Real-time signal processing system for serially transmitted data," and describes "the use of real-time application programming interfaces (APIs) interposed between application software or driver software and the real-time processing subsystem." An earlier analysis of the patent by Mueller revealed that the technology may be foundational to Android, making it "extremely hard" to work around. "In Android's case, it's possible that working around this patent requires a fundamental change to Android's architecture, and possibly even to the architecture of the underlying Linux kernel," he wrote in July. The ITC ruling also found HTC guilty of violating U.S. Patent No. 5,946,647, which supposedly relates to Android's "Linkify" functionality. The commission is expected to reach a final decision in its investigation on Dec. 6, 2011, with the option of either adopting or reviewing the Administrative Law Judge's determination. Both Apple and HTC have filed petitions for review. Mueller went on to state that Apple's argument for the '263 patent could pose a serious threat to Android and Google, as the company could be found to have willfully and intentionally infringed the patent, increasing Apple's chances of obtaining an injunction and tripling damages. Given that Apple is asserting the '263 patent against Motorola Mobility, Google's proposed acquisition of Motorola could actually increase its patent liability. "Apple could argue that Rubin works for MMI's parent company and could at least try to argue that willful infringement began at the latest when the acquisition was consummated, Mueller wrote. This isn't the first time that Rubin has faced accusations of willful patent infringement. Oracle is accusing Google of knowingly infringing on its Java platform, citing two emails from Rubin and another employee. "If Sun [purchased by Oracle in 2009] doesn't want to work with us, we have two options: 1) Abandon our work and adopt MSFT CLR VM and C# language - or - 2) Do Java anyway and defend our decision, perhaps making enemies along the way," Rubin reportedly wrote back in 2005.